As a co-sponsor of TOMS shoe project, CVAD and the Fashion Design program supported a competition for design of TOMS shoes. TOMS shoe project created by Marian O'Rourke-Kaplan, each student was given one TOMS classic shoe to redesign as they saw fit. 39 shoe designs from Junior and Sophomore students were juried by the Fashion Design faculty members on April 7. Cash prizes were awarded to 1st, 2nd and 3rd place winners. Design winners were invited to attend Private reception for Blake Mycoskie at Golden Eagle Suit of Union on April 13. Congratulations to Junior student Cassie Bumpous for receiving 1st Placc, Junior student Jelyn Hobson for 2nd Place, and Sophomore student Reagan Whitaker for 3rd Place (photo provided by Jelyn Hobson). Shoes were displayed at Avesta of the union (photo provided by Dean Milnes). Sophomore student Kaitlin Scott's shoe was chosen by Blake Mycoskie for his most favorite design (photo provided by Dean Milnes). 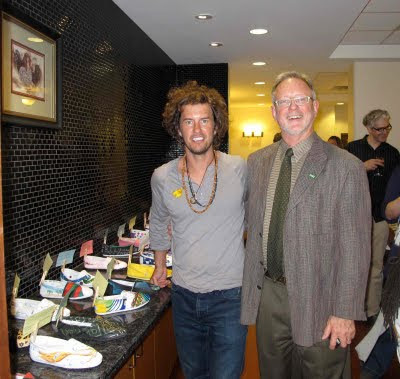 Blake Mycoskie and Dean Robert Milnes (photo provided by Pam Mycoskie).